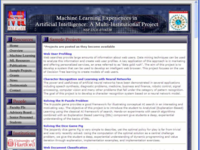 Machine learning tool that enables data mining through free online courses and big data processing. Pros: Weka Waikato Environment for Knowledge Analysis is a data mining tool which helps the users to analyze the data sets and identify patterns and make decision based on them. Weka provides data visualization and large number of algorithms which helps to analyze the data sets. Weka is a freely available software tool which can be downloaded through internet with out making any specific payment. Weka provides functions for data preprocessing. Using Weka users can mange null values ,deal with different data types and format data ranges easily .Preprocessing of large data sets can be easily done in Weka when considering the other data mining tools. Cons: Weka is implemented in java. In order to use Weka users need to have a certain knowledge about it. Once a user is given proper guidance or proper guidelines user may carry out the process with out any issue. But there must be a guidance with out proper instructions it is difficult to work on Weka. It is not easy to connect Weka with a separately developed user interface .It does not support all the IDEs .Weka supports only few java based IDEs like eclipse. Yet still it takes lengthy and complex coding to connect Weka with a user interface developed by any other IDE when comparing to the other tools. 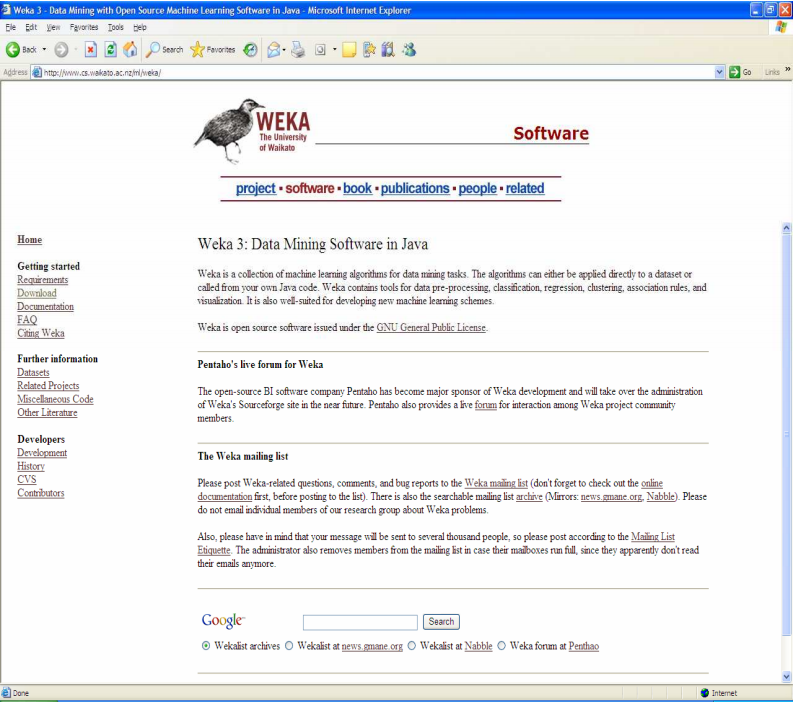 Overall: Weka is one of the main tools used for data mining .Weka provides large number of data mining algorithms for the users which helps the users to try any type of data mining technique through one software product. Also it provides data preprocessing facility which helps to format the data set. Pros: We can use this as very easily for designe data mining algorithms. This software gives very clearly graphical out puts. Very easy to work with software because there is no anything have to do very hard. it is user friendly also. It helps to user solve their problems and get quality predictions. no any breaking points. as well as there a re no any kind of mistakes. This software is very helpfull to me for do my datamining tasks. as a student and a employee. Cons: This software is mainly use for data mining using algorithms. So at that time if we can create this much more user friendly that is the best this ever do. But now also there is no big issue with that. Overall: Overall experience with weka is good. 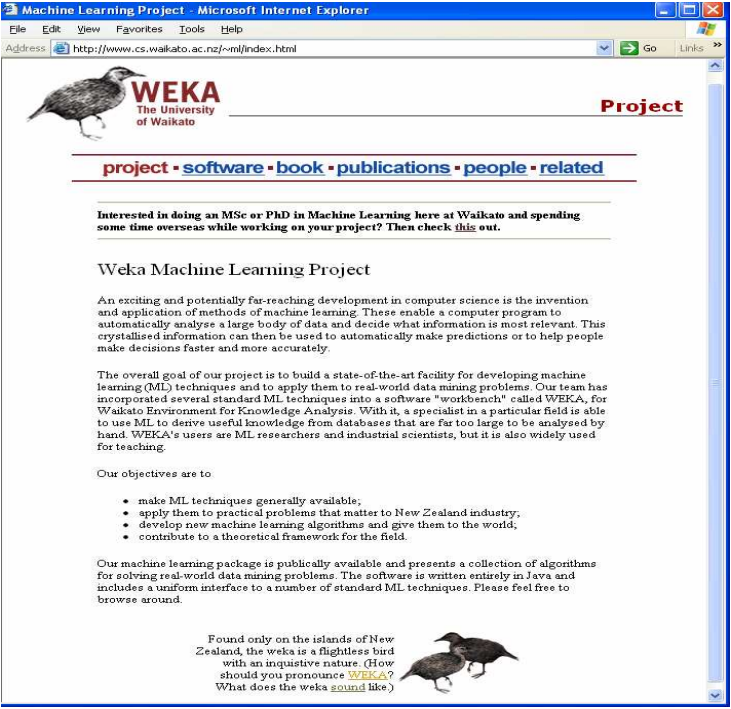 first I worked with weka for my university assignments. At that time I am not familiar with that. but in very small time period I was able to work with this environment because it is easy for handle. It gives very clear graphical details and those graphical details are very attractive. 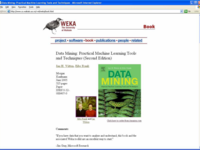 weka is the best software to do data mining. I taught Weka in a graduate course called Business Analytics. 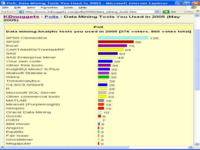 Pros: Weka is powerful and easy to use data mining software. Currently, it is open source. The free online courses associated with Weka are very valuable. Cons: The file format for Weka is not very popular. There is a learning curve. An intelligent assistant system would be very useful to help people understand errors. Overall: Weka is free and powerful. I used it to illustrate data mining concepts. 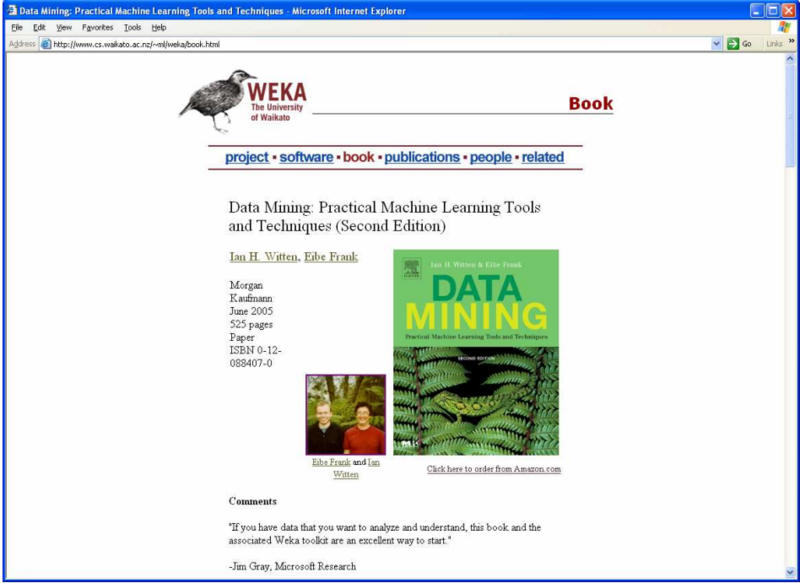 Pros: Weka was the first tool I had used for Data Mining. It's a good tool with all the bare minimum functionalities for any student. It provides as a great source of learning and exploration. As a student, I loved working with this software and writing reports of my findings. 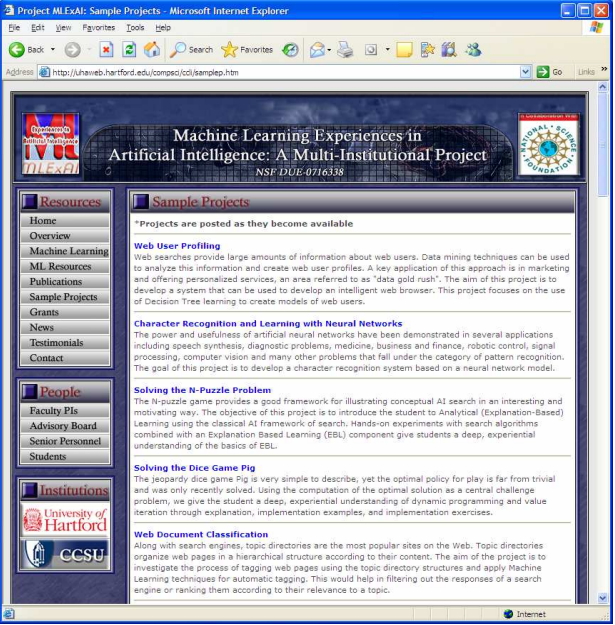 The machine learning algorithms that can be implemented with this software are also very easy to understand. Modifications and tweeking of the data and playing around with the input and being able to visualize it is a bonus. Cons: This software has very less documentation and support available online. Not many people have been using it. It needs more acceptance in the Data Mining industry, especially for introducing these tools to the students. It proves to be a very good resource and learning experience as seen in my case as well as my classmates. Overall: I could learn the basics of Data Mining and Data Warehousing with this software. It helped build the basics. I could explore a lot of things in the application very easily because of the ease of its usage. It should be a definite stepping stone for each and every student who is new to the world of data science. Pros: Weka is a program developed by academic and is free to use, which is great because I use it to teach the basics of machine learning to my computational social science students. Its simple interface is easy for them to use, and the different types of analyses to choose from, like decision trees, are great for them to learn from. Cons: I wish the regression analysis would give p values. But then again, if I am going to do regression then I will use Stata. That is not the focus of this software, so it's not a big deal. Overall: Perfect learning tool for teaching students! Pros: Had to proof a theory in data mining using Weka in my studies. This software thought me a lot about the subject when implementing as a university project a data mining algorithm. The result were reproducible on another software, but the my theory was learned and refine using Weka. Cons: Limited literature available and online support in case of issue. This took a lot of time to pass in order to enjoy the software functionality. But this is common in data mining software. Pros: It is great if you have a basic machine learning knowledge. The software contains several build-in features that allows you to do several minor customizations. Cons: You cannot customize the analysis very much. Rather use R if you need to leverage your data in more advanced way. Pros: The internal algorithms of machine learning used in Weka are accurate and give best results as association rules and the decision trees. This tool is simple to use along with good data representation inside the software itself. Also, its a free software. Cons: The User Interface is not up to the mark and the developer may feel the mining task as boring when it actually isn't. Also time taken for bigger data sets is quite long. Overall: I would recommend this software to new students or developers, however, it may not be the best solution for big organisations and companies.